birth also given as 1810 (Frost Gen.), buried Friendsville Cemetery, Wabash Co., IL. Sergeant in BlackHawk Indian War. 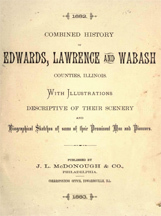 [S18817] Combined History of Edwards, Lawrence & Wabash Counties, Illinois - 1883. [S18851] 1810 US Census, Caneadea, Allegheny Co, NY. [S18853] 1820 US Census, Edwards Co, IL. [S18860] 1850 US Census, Wabash Co, IL.